﻿ Using Stones for Personal Growth. Garnet: Considerateness. 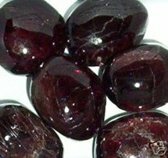 Garnet exists in a number of varieties and can have various shapes and colors. The type of garnet that most people are familiar with is Almandine, which forms rhombododecahedral crystals, and reveals a transparent red or violet color when held up to the light. 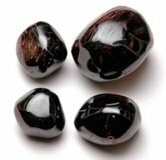 Garnet was named from "granatum", the pomegranate, because its crystals resemble the pomegranate seed coating in shape and color. The ancient Hebrews named the garnet "barak", meaning lightening, and according to traditional beliefs, Noah used a garnet to light the Ark. Garnet is also a part of many other legends. Garnet acts on the Inner Being to strengthen Considerateness. Considerateness is the ability to anticipate the impact your actions will have on yourself or on others. It is considering the consequences of your actions before you act. It is thinking about how your actions affect yourself and other people. Considerateness is a kind of thoughtfulness that sees the connection between cause and effect, and then acts to produce the most beneficial effect. You are being considerate when you look at the different ways you could do something, visualize the outcome in each case, and figure out which approach gives the best result. Considerateness has two parts to it: The first part is being considerate and acting with regard for the impact of your actions. The second part is knowing what is considerate, knowing how to distinguish a considerate action from an inconsiderate action. If you are good at recognizing what is considerate, you are also good at acting in ways that create the effects you want, and avoid acting in ways that create effects you don't want. If you usually anticipate the impact your actions will have on others, you are said to be considerate of others. For example, suppose there is something you want to tell your friend, but he is working and seems to be concentrating very hard. If you are a considerate person, you will look at the disruption you are likely to cause, and if what you have to say is of less than monumental importance, you may decide to wait until later to talk to him. If you usually anticipate the impact your actions will have on yourself, you are said to be considerate of yourself. For example, you are being considerate of yourself when you are making an appointment with someone and you give him your phone number so he can call you if it turns out that he can't keep the appointment. Considerateness comes from considering the impact of your actions before you act. If you sometimes don't take time to look at how a given act or situation will impact yourself or others, but are oblivious to it, you are being inconsiderate. And if you don't at least look at the different possibilities in a situation, you will never come up with the best solution to a problem. A lack of thoughtfulness in looking at consequences will keep you from finding the course of action that produces the best result. So instead of disregarding, overlooking, or ignoring the impact of your actions, put a little energy into taking a look at the consequences of your actions before you act. To practice becoming more considerate, look at a particular situation and consciously go through the scenario of asking yourself "If I do this, how will it impact so-and-so? And is what I am going to do worth what it might do to him?". Consider the consequences of your actions, and if an action appears likely to have a negative impact, rethink how you are going to do it. Also, to become more considerate, practice building respect for people who operate their lives in ways which you value. When you respect someone and acknowledge his worth, you will automatically be more considerate of that person. In addition, practice letting your friends know you are always available to help them. It is comforting for a friend to know that you have anticipated his need for your help, and that you are considerate enough to offer that help even before it is actually needed. In this case the impact of your considerate action is to put your friend's mind at ease, since he knows that support has already been offered and is there when he needs it. Learning to be considerate is a little like learning to drive a car, in that it becomes automatic with practice. You know you have become a considerate person when you habitually anticipate impact without consciously thinking about it. To help you in becoming more considerate, carry a garnet with you. Any of the stones in the garnet family strengthens the Inner Being in this way. In addition, garnet is one of the "grounding" stones. A grounding stone is any stone that helps make you more reality-oriented, and pulls you closer to the physical reality you live and work in every day. Garnet helps "ground" you by strengthening your ability to anticipate the impact of your actions, which is strongly reality-oriented.